This recipe makes enough curing mix for two 2 – 3 pound sides of filleted salmon. You can easily make the recipe with a 1 – 2 pound salmon fillet: cut the curing mix in half and the curing time to 24 to 36 hours. Once cured, gravlax should be stored in the refrigerator or freezer. I crack peppercorns in a mortar and pestle, but you can also do it by whacking them with a meat mallet. Wash and dry salmon fillets and remove any pin bones (I use stainless steel needle-nose pliers for this task). Cut off belly flaps and as much of tail end as is necessary for fish to fit in 9 x 13” glass or stainless steel baking pan. Reserve salmon trimmings for another use. Mix together sugar, salt and peppercorns; this is the curing mix. Lay sides of salmon, skin side down, in the baking pan. Rub half the curing mix into each side of salmon. Spread dill out on one salmon side. Drizzle 1/3 cup of citrus vodka over both salmon sides, being careful not to wash away the curing mix. Quickly flip salmon side without dill so it is on top of other salmon side, flesh sides together. Cover baking pan with plastic wrap. 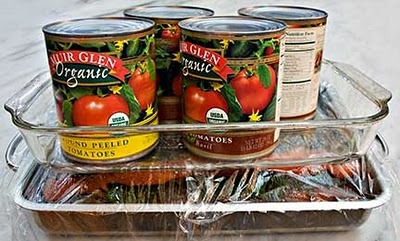 Place empty glass or stainless steel baking pan on top of plastic wrap and fill it with canned goods to weight down salmon. Refrigerate. Every 12 hours, remove fish from refrigerator, turn over salmon, put weight back on fish, and return it to refrigerator. Cure fish for 2 – 3 days. Scrape off dill and peppercorns with your fingers. Pat gravlax dry, and store in the refrigerator or freezer until ready to use. 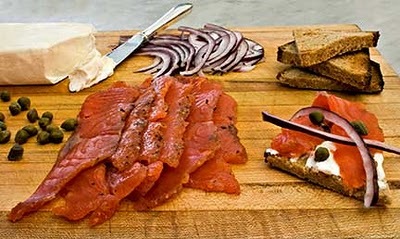 To cut gravlax, hold knife at angle and cut 1/8″ thick slices of fish on the diagonal.